Delegation of Euskadi in U.S. In many cultures where the seasons change and winter is harsh, there is oftentimes a winter celebration figure or mythical personage around whom the festive revelries of midwinter revolve. This ritual serves as the hub of activities around which the clan, the community and the nation identifies in their collective attempt to break the wintry chill of outdoor inactivity and to fill the still, sometimes foreboding silence of the snowclad countryside. Whether this figure is called "Papa Noel," "Santa Claus," or "Olentzero," the motif is the same. But the Olentzero didn't start out being a Santa Claus figure. The story of how this happened shows some creative license. Some of today's celebrated traditions were derived from Christian influence, but others are products of older religions. The pre-Christian era celebrated the end/beginning of a year, while for Christians their year end/beginning was Easter. So the older tradition was assimilated and Christians moved the celebration of the birth of Christ to this season. 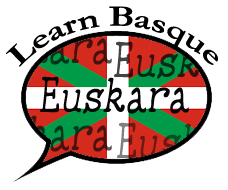 There are various ways of saying Christmas in Euskara, including "Gabonak and "Natibitate," but the most widespread term is "Eguberria" or "new-day" in Basque. Today we know the Olentzero as the mythic winter figure, but he takes his name from an older custom. The word "olentzero" is the combination of two words--olesen-aroa--which gives us an indication of the figures significance. The meaning of "aroa" is clear, meaning "time" or "season," but "olesen" is an old Basque word that is preserved only in old folk-songs. From Otxandiano, Bizkaia comes the verse: Aterik ate oleska,/ beldurtu barik aize hotzaz/ hemen gaituzu kantatu naiez/ irigi zuen bihotzak. And from Urdiaingo in Nafarroa: Olez, olez/ bakallu jalez/ bost eta sei hamaika/ tx­orixorik ez balin badago/ igual dela lukainka. Peru Abarka, in a 19th century book, writes: Olesa ta ate-jotea da, nor ote dogu? From this context, we see that "oles" means to call or ask, and in many other songs it is also associated with collecting presents. We can trace the transformation of the word from "olesen-aroal" to "olezen-aroa" to "olentsen-aro" to "olentzen-aroa" and finally to Olentzero. 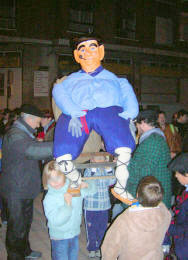 Olentzero, for earlier Basques, was the season of asking from house to house. This custom is still maintained in some Basque villages as the youth go from house to house, dancing and singing, collecting food or money to prepare a special meal. Like a good many things Basque, we do not have certitude as to the exact origins of this winter personage. Over the centuries the "story" of Olentzero has been adapted. The first written account of Olentzero is from Lope de Isasi back in the 16th century. In his account, the character is called "Onentzaro," and his version tells of a time thousands of years ago when there was a tribe of jentilak (giants in Basque mythology) and Olentzero was one of them. They lived in the forests of the Pyrenees in Nafarroa, in the area of the village of Lesaka. One day the people of this tribe discovered a glowing cloud in the sky. They feared that this celestial phenomenon was the divine sign of the arrival of the imminent birth of Jesus. None of them could look at this bright cloud except for a very old, nearly blind man. They held him up to take a look. He turned pale and confirmed their wildest fear: "Yes, this is the sign, Jesus will be born soon". They feared that vast changes would come with the arrival of Jesus and the demise of their way of life. After foreseeing this terrible news, the old man only saw a solution in terminating his life. So he asked his giant friends to throw him off the highest cliff. They complied. But on the way back down the mountain, the group of giants tripped head over heels and fell to their death. All, except one. The only survivor Olentzero hiked to the villages in the valley and with his sickle brutally cut the throat of those people who ate too much on the day before the arrival of Christ, i.e. on the 24th of December. He himself was not the fasting type. He was a thick glutton who could eat huge quantities of meat which he washed down with strong liquor. No surprise that he was frequently drunk and irritable (and sometimes depicted with a bottle nearby). Now of course this wasn't a "feel good" story for the holidays, so over the last century this legend was adapted because young children didn't like to hear about a grumpy giant who sliced open the throat of normal citizens and let them bleed to death. A more civilized version had to be created. More precisely the church wanted to shift pagan rites to be associated with Christian traditions. In this case, the church wanted to turn the pagan custom related to the winter solstice into a Christian feast with a Christian-like hero. Furthermore, Basque nationalism wanted an alternative to the Spanish tradition of the Magi (Three Kings) and the French and North European Pere Noel or Santa Claus. The new, cleansed, Christianized version of the story is of Olentzero as a human, a humble man with a heart filled with love. As a new born he was left alone in the woods where a fairy with long blond hair found him, adopted him, gave him the name Olentzero and raised him. He turned into a strong man and worked as a charcoal maker. He was hard-working and gifted with his hands. He carved wooden animals, toys and dolls. When he had a big charcoal bag full of toys he hiked to the village in the valley and distributed the wooden figures amongst the children because he liked to see them happy. He played with them all afternoon. The kids loved him and Olentzero came back whenever he had finished another bag of toys. Whenever he came to the village the kids surrounded him. One day as he came down to the village he found a house in flames. He dashed towards the house finding crying children behind the closed windows. Without hesitation he ran into the house and freed them by lowering them from an upstairs window. With everyone safe he went downstairs when the house collapsed under the fire, burying him. The people from the village had gathered by now outside the burning ruins and they suddenly saw a white flash leaving the flames and heading towards the sky. The fairy that had found him in the woods had come to be with him in this moment. She said, "Olentzero you have such a good heart, you even gave your life for others. You should not die. 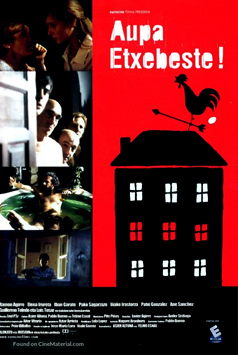 You shall live forever, making toys for all the children in this village and in the whole Basque country." And that is now how the story is told so that on the 24th of December, the Olentzero makes his annual appearance. His image is conjured up by villagers, sometimes made of paper mache, sometimes even a carved figure. 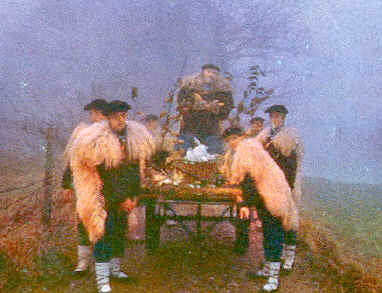 His image changes from place to place, but he is characteristically dressed in the traditional "baserri" or peasant farmer's garb of dark pants tucked into socks below the knees; "abarkak" or leather, rope tied shoes; a dark overshirt sometimes with a coat of natural wool; a black beret, staff and a smoking pipe. He is paraded through the streets, choral groups accompanying him comprised mostly of youthful choristers, dressed in similar costume and bundled up for protection from the chilling wintry winds. 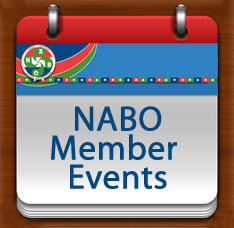 © Copyright 2013 North American Basque Organizations, Inc.